What it means and how to read it. In Canada, almost all pre-packaged foods has a Nutrition Facts Table. The label looks the same on most foods. This makes it easy to find and easy to read. Percent Daily Value These percentages are based on recommended daily allowances for a 2,000 calorie diet. The % DV will help you determine if the serving of food is high or low in a nutrient and may help provide a quick reference when comparing labels. Serving Size The nutritional information on the rest of the Nutrition Label applies to the serving size. When comparing labels, it may help to look at the serving size for an equal comparison. Nutrients There are 13 core nutrients that must appear in the NFT. The nutrient information in the NFT is based on a specific amount of food (stated serving size). Vitamins and minerals are expressed only as a % DV based on a daily recommended intake. Most of the other nutrients are provided in grams or milligrams and as a %DV based on a reference standard. You can use this section to see whether the product contains certain nutrients you are trying to eat more or less of or avoid.
} This applies to all nutrients. It gives you energy (also called calories). It helps your body absorb vitamins A, D, E and K.
It helps your body grow and develop. Fats, such as mono- and polyunsaturated fats, can help lower blood cholesterol and protect your heart. Plus, fat helps your body absorb the important vitamins and minerals it needs. But limit your intake of saturated and trans fat, which can raise your blood cholesterol and increase your risk of heart disease. Saturated fat is a type of fat found in food. It has been shown to raise LDL or "bad" cholesterol levels. High LDL-cholesterol is a risk factor for heart disease. Trans fat is made from a chemical process known as "partial hydrogenation." This is when liquid oil is made into a solid fat. Like saturated fat, trans fat has been shown to raise LDL or "bad" cholesterol levels. High levels of LDL-cholesterol are a risk factor for heart disease. Unlike saturated fat, trans fat also lowers HDL or "good" cholesterol. A low level of HDL-cholesterol is a risk factor for heart disease. Most Canadians should lower their intake of saturated and trans fats to reduce their risk of heart disease. See our Info Article "The Skinny on Trans-Fat"
Calories from Fat Calories can come from carbohydrate, protein, and fat. Whereas protein and carbohydrates have four calories per gram, fat has nine calories per gram. The calories from fat number helps you monitor your fat intake. 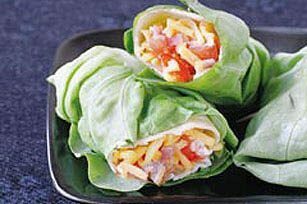 It's recommended that fat makes up no more than 20 to 35 percent of your daily diet. Cholesterol is a type of fat made by the body. It is also found in some foods. Foods that are high in saturated and trans fats may increase your blood cholesterol level. This increases your risk of developing heart disease. Foods that are high in cholesterol may also increase your blood cholesterol level. Limit your daily intake of cholesterol to 300 milligrams to keep your heart and circulatory system healthy. Cholesterol only comes from animal-based foods, such as cheese, eggs and meat. It is not found in plant-based foods, such as fruit, grains and vegetables. The % Daily Value for cholesterol is optional. This means that a food company may choose to show it in the Nutrition Facts table if they want to. Sodium Diets low in Sodium may reduce the risk of high blood pressure. The recommended daily limit for an average adult is 2,400 milligrams. It is estimated that 77% of the sodium eaten in the typical North American diet comes from processed food products. Only 5% comes from the salt we add to our food at the table. Carbohydrates Total carbohydrate includes sugar, starches, and fiber. Choose carbohydrates wisely. Foods such as fruits, vegetables, grains, and milk have carbohydrates and provide many nutrients. However, foods where the carbohydrate count is coming from added sugars have little nutritional value. Carbohydrates are important nutrients for your health. They are the body's main source of energy (Calories). The main kinds of carbohydrates are fibre, starch and sugars. 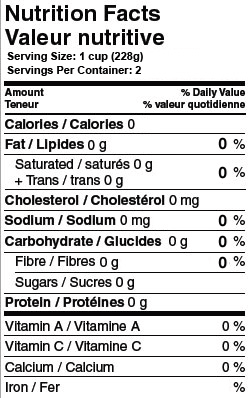 The amount of carbohydrates in the Nutrition Facts table includes fibre, starch and sugars. Fibre and sugars must be listed under carbohydrates. Starch is optional, which means that a food manufacturer can list it if they want to. Sugars A type of carbohydrate. The sugar grams include both added sugars, which are added during processing, and natural sugars, found in items such as milk and fruit. To find out whether a food contains added sugars, look at the ingredient list on a package. Protein Your body uses protein for energy and to keep your muscles and organs working properly. Protein helps build and repair body tissues and helps build antibodies. Even if you eat a vegetarian diet, you do not need more protein. You can still meet all of your protein needs by eating a varied diet as recommended in Eating Well with Canada's Food Guide. Vitamin A Plays an essential role in your vision, and maintenance of healthy skin, hair, and mucus membranes. Riboflavin Works with other B-complex vitamins to process calories from carbohydrates, protein, and fat. It also promotes healthy skin and good vision. Pantothenic Acid Helps your body's cells produce energy and metabolize protein, fat and carbohydrates in food. Folic Acid Important for the production and maintenance of new cells and tissue growth. Folic acid is especially important for pregnant women and babies. Vitamin C An antioxidant that helps maintain a healthy immune system and resist infection. It also helps your body heal from a wound, and keeps gums and muscles in good shape. Vitamin D Vitamin D helps your body absorb calcium. Look for foods with vitamin D such as fish like herring, mackerel, salmon, sardines and trout, fortified soy beverages and milk. An antioxidant that maintains your body's eye and skin tissues and your liver. (Folic Acid) Important for the production and maintenance or new cells and tissue growth. Folic Acid is especially important for pregnant women and babies. Vitamin B6 Vitamin B6 is a factor in energy metabolism and tissue formation. Iodine Iodine is necessary for proper production of thyroid hormone. Natural sources of iodine include sea life, such as kelp and certain seafood, as well as plants grown on iodine-rich soil. Salt for human consumption is often fortified with iodine and is referred to as iodized salt. Transports oxygen throughout the body. There are two types of iron: heme and non-heme iron. In the Nutrition Facts table, the nutrition information includes both types of iron. Manganese Manganese is an essential trace element and is necessary for good health. Manganese can be found in several food items, including grains and cereals, and is found in high amounts in other foods, such as tea. Biotin Helps your body's cells produce energy and metabolize protein, fat and carbohydrates in food. Calcium Is essential for bone health and may help reduce the risk of osteoporosis. Also plays a role in normal nerve function and healthy blood clotting. Phosphorus Helps your body's cells produce energy and regulates metabolism. It's also necessary for strong bones and teeth. Selenium Incorporated into proteins that help prevent cell damage caused by free radicals. Free radicals are molecules containing oxygen that attack and damage cells in the body. Potassium Necessary to help your muscles contract and to maintain fluid and electrolyte balance in your body cells. It also helps your body transmit nerve impulses. Chromium Moves blood sugar (glucose) from the bloodstream into the cells to be used as energy. It also turns fats, carbohydrates, and proteins into energy. Fluoride Helps maintain hard tooth enamel and protects your teeth from decay.